It is true to say that the iPhone is indeed a great smartphone of our modern time because it offers quite a large number of things that make you feel very comfortable. Like android devices, iPhones have innumerable downloadable apps that enable you to contact your friends and loved ones any time and in anyway you want. The most notable apps of the modern era for your iPhone device are those ones which let you call your friends for free. If you want to save money on both local and international calls, there are numerous iPhone apps that might aid you. It is important to mention that the functioning of these apps is based on VoIP (Voice over Internet Protocol) service. The following is a list of 8 of the best iPhone apps that let you call for free. This is one of the best iPhone apps with cool features that include added ability to show your location to the people you call. Viber not only allows you to make calls absolutely free but also allows you to send texts and chat with your friends. It broadcasts on high definition sound quality and it is completely ad free. It is also integrated with your phonebook meaning that you don’t have to sign up for an account like in other apps. Skype is the only app with over 600 million users from all over the world. 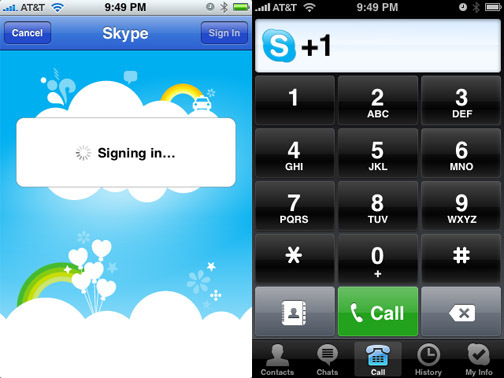 Initially, users were only able to make free calls to other Skype users using desktop versions of this app. This has changed with the introduction of mobile version which allows you to make calls over your existing GPRS, 3G or Wi-Fi networks. Unlike Viber which lets you call almost every network for free, the NetTalk iPhone app only allows you to call landlines in the United States and Canada for free over 3G or Wi-Fi. With this iPhone app, you can record and import your favorite conversations to your phone book. NetTalk calls are of excellent quality. Fring is an old-timer in the VoIP community; it works in its own network like Skype. The Fring app for iPhone app allows you to make free Group video, chat and voice calls. However, these services are only available on an updated version of the app. iCall is one of the best iPhone apps that let you call for free and has the best features combined within the app. It has the option that lets you make free calls to any phone number in the United States or Canada. However, you can also call worldwide from this app. Tango specializes in free video calling across iPhone and Android devices as opposed to a majority of the other iPhone apps mentioned above. Since its first version, tango has improved in the most recent release offering high quality video calls. Nimbuzz is one of the main players in cross-platform IM apps. It operates in the same manner as Fring by enabling you call other Nimbuzz users for free. The main advantage of this app is that it is available on every smartphone platform worldwide. This is the best app for your iPhone since it allows you to call as well as send text and multimedia messages to your friends for free. The only advantage of this app over the others mentioned above is its ability to use Bluetooth to make hands free calls. Author Bio- This post has been written by Queen Smith. She loves to write about Mobile Apps and various Calling Services. She recommends Concorde Communications for the best answering service.